Canadians generate a lot of practical, innovative ideas. But as many experts have pointed out, Canadians have been missing out on some of the benefits of commercially exploiting these ideas. For example, Toronto’s Impact Centre reports that while inventors working in Canada are ranked eighth in their contributions to the US patent office, 58 percent of these patents were assigned to companies located in other countries – up from 45 percent in 2005. In this edition of Graphic Intelligence, we highlight how this issue plays out in Canada’s international trade balance. 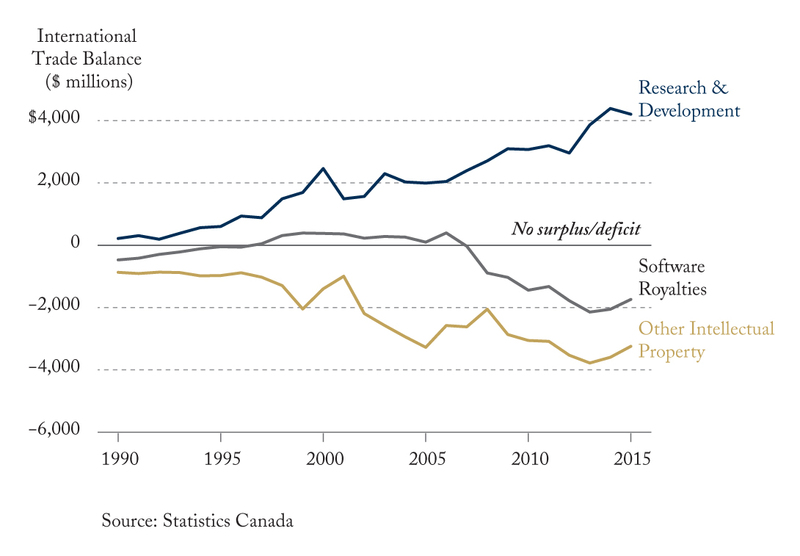 Canadians are generating an increasing surplus with the rest of the world for research and development services – that is, what foreign firms purchase from “brains” in Canada. At the same time, Canada registers a similar-sized deficit with respect to payments to foreign owners of intellectual property – patents, industrial designs, and copyright – reflecting that intellectual property used in Canada has been, on balance, commercialized in other countries. To its credit, the 2017 federal budget recognized that the “commercialization gap” is an essential part of the problem, specifically because it is what links innovation to domestic jobs. Ideas embodied in consumer products, machines, software, processes or designs, and creative activities in general, will likely come to dominate valuable economic and social activities and the jobs associated with these activities. Higher standards of living would accrue to Canadians if they were not only at the forefront of generating great ideas, but also pursuing business growth and job creation based on them. Aaron Jacobs is a Researcher, and Daniel Schwanen is Vice-President of Research at the C.D. Howe Institute.